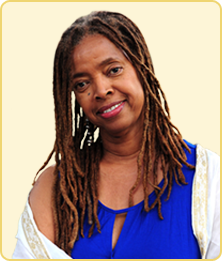 Dr. Kamala Easton is a spiritual teacher and acclaimed motivational speaker in the fields of education and spirituality. A certified yoga instructor, Kamala is the creator of several life-enhancing workshops including Embodying the Goddess, Embodying Spirit: Journey Towards Enlightenment, and Divine Intervention for Weight Management. Kamala is personally aware of the many paths transformation can take. After leading a conventional life in academia for nearly twenty years during which she obtained a Ph.D. in education from UCLA and a B.A. in psychology from UC Berkeley, Kamala experienced a dramatic shift. She had a life-changing awakening and merged into oneness with the Divine in 1999. A complete spiritual transformation. Subsequently Kamala traveled and lived in India for nine years, owned an energy-healing practice in Malibu, California, appeared on PBS and Discovery Channel and was a member of UCLA Medical Center’s Complementary Medicine Pediatric Pain Program. Today, as an enlightened master, Kamala works with participants to explore their own spiritual ascension. With her distinct down-to-earth wisdom and light-hearted humor, she imparts the highest knowledge about what keeps people collectively and individually from stepping through the veil toward a path of happiness and achieving their heart’s desires. Sharing her understanding and deep love of the Divine, Kamala works with participants to discover the Divine Feminine, love of self, and the very nature of enlightenment and how it can be achieved by all.